The Jeep Cavalcades and the short cut to Telluride called Black Bear. In the late fifties an idea was born that involved Ouray, Silverton, Telluride and Lake City. The idea of seeing the San Juan Mountains by Jeep was spreading and gave birth to the Jeep Cavalcade to the San Juan Rockies. On August 30 and 31, 1958, publicity men from top flight magazine and news agencies came to Ouray to check out the test run for the 1959 Colorado Centennial Rush to the Rockies Caravan. While the plan was in the formation stage the name changed in various news accounts. Over 100 Jeeps where expected to make the San Juan trial run from Ouray. They were to leave Ouray on August 30 at 9:00am, travel over Engineer Pass to Lake City for Lunch, then over Cinnamon Pass to Silverton to enjoy a melodrama called “They Waz Et” based on the Alfred Packer story. On the 31st they would leave Silverton over Ophir Pass to Telluride for lunch and late that Sunday they would finish in ether Montrose or back to Ouray. The trial run was a huge success and plans continue for the 1959 event now becoming known as the Jeep Cavalcade. When spring of 1959 arrived, 207 editors visited Ouray traveling in Trailway Buses. 18 Ouray Jeeps met them in Silverton and with thirteen Jeeps from Silverton brought about 100 members of the National Editorial Association group back to Ouray by way of Eureka, Animas Forks and Poughkeepsie Gulch. I understand that this was before Corkscrew Pass was built, which was built as a road for Core Drilling Rigs in the early 60’s, but really they dared to do Poughkeepsie! The Founding of Black Bear Pass! As of yet there was no road over the mountains from Ouray to Telluride. Buddy Davis of Ouray and the Telluride Jeep Club started formulating plans, but money would be needed. By April 9, 1959 34 signatures from Telluride and Ouray pledged $1,210 towards what was considered a $2000 project (in contrast to the recent improvement of the short Poughkeepsie Gulch bypass around the wall that cost $67,450 today). The proposed route was a new shortcut Jeep road to Telluride over the old Black Bear route via Ingram Falls and tying into the present road from the top of Red Mountain Pass. 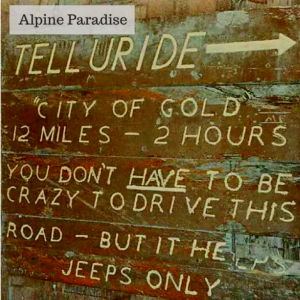 In a letter from Don O’Rourke (Father of Jerry and Don O’Rourke of Telluride Outside Tour fame) Telluride Jeep Cavalcade Wagon Boss stated that a number of Ouray residents had already shown an interest in the road and he felt sure that many others would be willing to help when the proposed project was given publicity. All money collected would be used for road construction only and Jeep Club 50 wanted it understood that no pledges would be collected until it was determined that enough money had been made available to put in the road in shape for Jeep travel. Jeepers and all others who wished to make a pledge toward the project where asked to contact Buddy Davis. Success! Black Bear is open by the end of Summer. You don’t have to be crazy to drive this road- but it HELPS! By August 20, 1959 the Ouray County Harold announced “Yesterday Buddy Davis of Ouray took his first charterload over the Ouray to Telluride road and his passengers were thrilled with the trip. [Can you imagine being not the first group for the season but first group ever to ride over Black Bear?] They were Mrs. Darrell Wilson and daughter [wonder why Darrell chickened out? ], and Mr. and Mrs J.C. Rile all of Jacksonville, Illinois” Several Jeeps driven by both Ouray and Telluride folks also made the trip over the new Black Bear Mine Road. The road, although passable, required that even the conventional jeeps had to back up to make the turns on several of the switchbacks. It was recommended that station wagons not attempt the road at the present time. I am sure they are talking about the Jeep wagons. The summer of 1959 marked a high point to the development of Jeeping/4-Wheeling in the San Juans and with the new road to Telluride one of the most popular trips had been opened up!! We will have to wait till 1966 to see the addition of Imogene Pass!